For the last few years, the apple harvest in my area has been abundant and neighbours growing orchard fruits have been hard pressed to give away their surplus crops. Boxes and bags filled with bramleys and Blenheim orange apples, stacked up by garden gates with hand-written ‘apples for free’ signs are not an uncommon sight September- October time, and as an obsessive preserver I’ve been ready and waiting to take full advantage. But after this year’s early burst of spring followed by what seemed like months of summer rain, the 2012 harvest is set to be on a much more modest scale. Apple and pear trees usually heaving are either bare or noticeably sparse. One neighbour, with her own orchard, told me, the bees just weren’t around at the right moment to pollinate the blossom. Thankfully there is always some crop or other that has benefited from another’s struggles and this year the blackberries in the hedgerows seem plumper and more plentiful than I’ve ever seen them before. 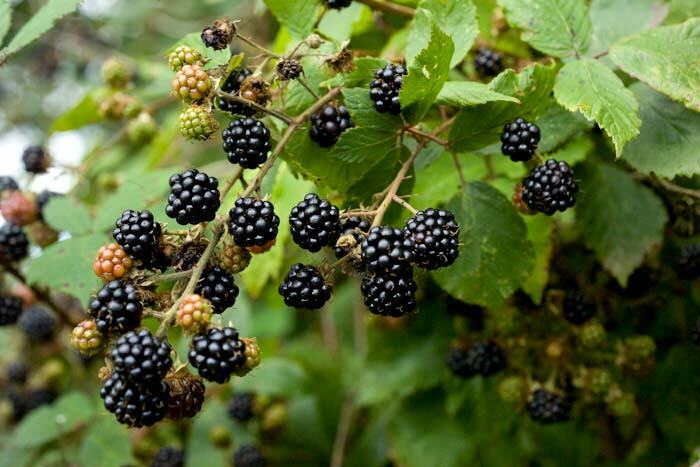 The early foraged blackberries, usually containing more pectin, make the best jam with good setting power, whilst the later ones are more useful for cordials and chutneys. By mixing them with some of the few apples around, I’ve managed to eek out the best of both worlds. The two wild apple trees near to home still carry a few fruits that need using up. 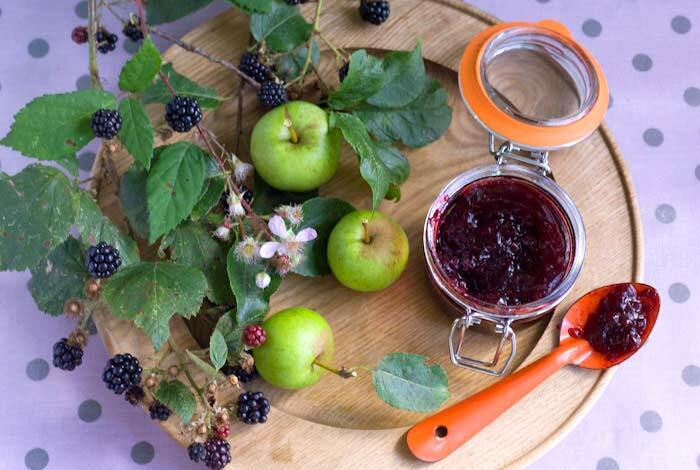 Blackberry and apple jam is a classic that works equally brilliantly for breakfast, spooned onto scones or, as the purists serving suggestion, on bread and butter. 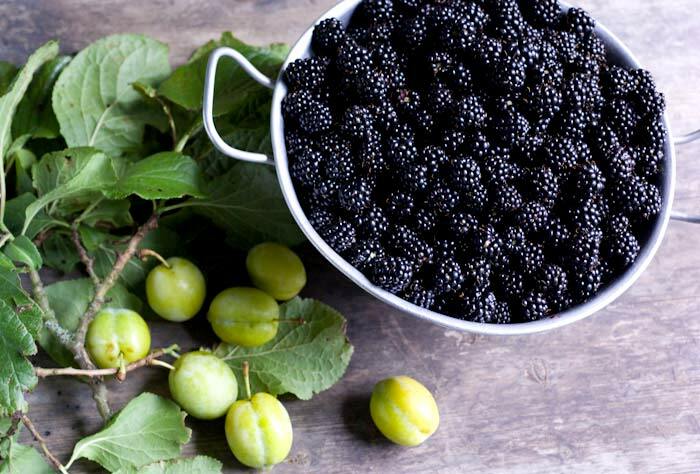 I prefer to leave the blackberries whole and love their texture, but you can put the fruit through a food mill or sieve to make a smoother seedless jam more to your liking. I acquired a rose attar scented pelargonium earlier in the year to pair with blackcurrants, so here’s another opportunity to break off a few leaves and add them to the pot. It just adds the extra element required to make this simplest of jams into something exceptional. Cook the apples with the water or apple juice until the fruit begins to break up and becomes soft. Add the blackberries and lemon juice and simmer for a further 10-15 minutes. If you prefer a seedless jam, allow the fruit to cool then run it through a food mill or push through a sieve and continue with pureed fruit. 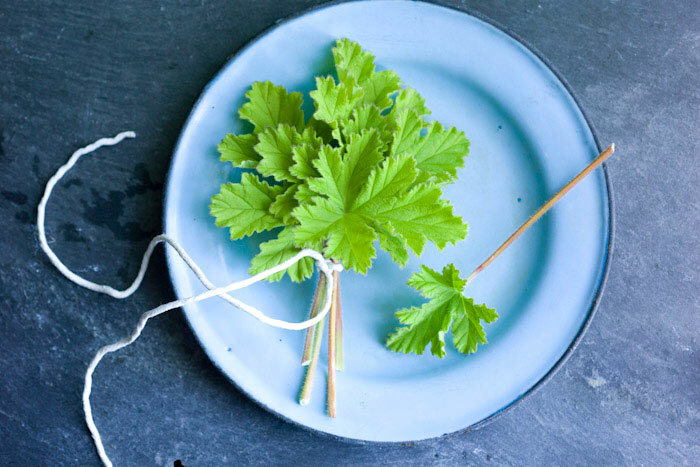 Add the geranium leaves tied together in a bundle and the sugar to the fruit and stir over a gentle heat until the sugar has dissolved, bring to a simmer then remove from the heat and leave for the flavours to macerate for several hours or overnight. If you plan to can (water process) your jam, prepare the water bath and jars and place jar seals in a pan of hot water on the hob. Using a preserving pan, bring everything to a rolling boil and maintain the heat until it reaches setting point and a blob of syrup readily forms a skin as it cools on a cold plate. It only took me 5 minutes to reach a set with my jam. Fish out the geranium leaves and discard them. Pour the jam into hot sterilised jars and seal. If you are canning your jam, process for 5 minutes then remove from the canner.